Zithranol-RR contains anthralin, a synthetic compound whose precise mechanism of anti-psoriatic action is not yet fully understood. However, numerous studies have demonstrated anti-proliferative and anti-inflammatory effects of anthralin on psoriatic and normal skin. The anti-proliferative effects of anthralin appear to result from both an inhibition of DNA synthesis as well as from its strong reducing properties. 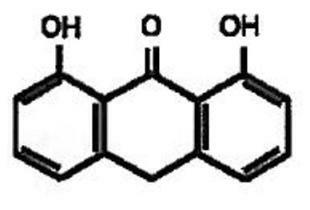 Recently, anthralinâ€™s effectiveness as an anti-psoriatic agent has also been in part attributed to its abilities to induce lipid peroxidation and reduce levels of endothelial adhesion molecules which are markedly elevated in psoriatic patients. Unlike retinoids and PUVA, anthralin does not inhibit liver microsomal enzyme activity; consequently, the likelihood of adverse drug interactions is greatly reduced when other agents are administered concomitantly with anthralin. 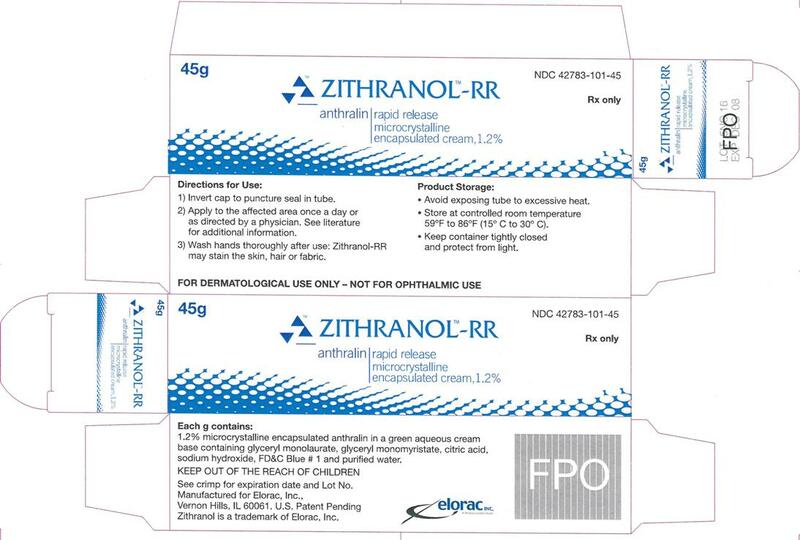 Since Zithranol-RRâ€™s proprietary microcrystalline delivery system rapidly releases anthralin into psoriatic plaques on contact with skin, Zithranol-RR is especially useful for short contact (5-15 minutes) therapy with anthralin. For the topical treatment of patients with stable plaque psoriasis. Zithranol-RR is contraindicated for patients with acute or actively inflamed psoriatic eruptions or a history of hypersensitivity to any of the ingredients. Avoid contact with the eyes or mucous membranes. Exercise care when applying Zithranol-RR cream to the face or intertriginous skin areas. Discontinue use if a sensitivity reaction occurs or if excessive irritation develops. General: To prevent the possibility of staining clothing or bed linen, it may be advisable to use protective dressings. To prevent discoloration of tub/shower, always rinse the tub/shower with lukewarm water immediately after washing/showering and then use a suitable cleanser to remove any deposit on the surface of the tub or shower. Contact with fabrics, plastics and other materials may cause staining and should be avoided. Always wash hands thoroughly after use. Keep container tightly capped when not in use. Avoid excessive heat. For external use only. Keep out of the reach of children. Carcinogenesis, mutagenesis, impairment of fertility: Long-term studies in animals have not been performed to evaluate the carcinogenic potential of the drug. Although anthralin has been found to have tumor-promoting properties on mouse skin, there have been no reports to suggest carcinogenic effects in humans after many years of clinical use. Animal reproduction studies have not been conducted with Zithranol-RR cream. It is also not known whether Zithranol-RR cream can cause fetal harm when administered to a pregnant woman or can affect reproduction capacity. Zithranol-RR cream should be given to a pregnant woman only if clearly needed. Nursing mothers: It is not known whether this drug is excreted in human milk. Because many drugs are excreted in milk and because of the potential for tumorigenicity shown for anthralin in animal studies, a decision should be made whether to discontinue nursing or to discontinue the drug, taking into account the importance of the drug to the mother. Very few instances of contact allergic reactions to anthralin have been reported. 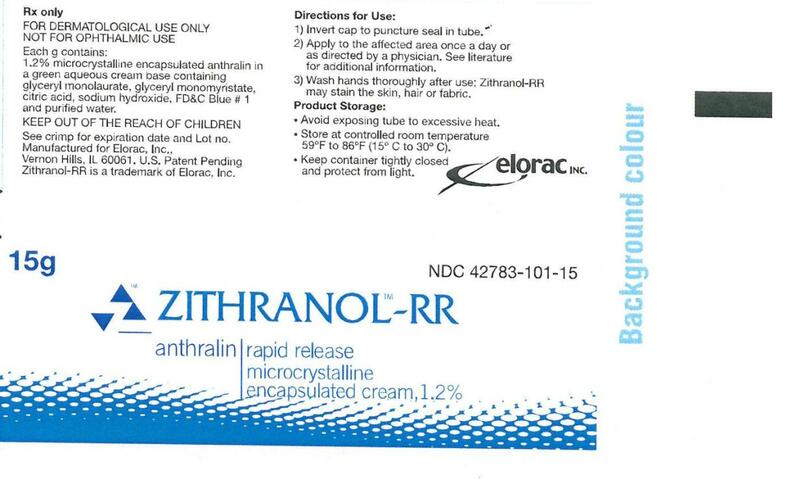 Transient primary irritation and staining of normal or uninvolved skin surrounding the treated lesions, which is frequently seen with other anthralin preparations is less common with Zithranol-RR due to microcrystalline coating of the anthralin particles. If the initial treatment produces excessive soreness or if the lesions spread, reduce frequency of application and, in extreme cases, discontinue use and consult a physician. Some temporary discoloration of hair and fingernails may arise during the period of treatment but should be minimized by careful application. Staining of fabrics may be permanent, so contact should be avoided. Generally, it is recommended that Zithranol-RR cream be applied once a day. Anthralin is known to be a potential skin irritant. The irritant potential of anthralin is directly related to the strength being used, the time of contact, and each patientâ€™s individual tolerance. Where the response to anthralin treatment has not previously been established, commence treatment using a short contact time (5 â€“ 15 min.) for at least one week. When a short contact time is used initially, it can be increased stepwise to thirty minutes before removing the cream by washing or showering. The optimal period of contact will vary according to the patientâ€™s response to treatment. For the skin: Apply sparingly to the psoriatic lesions avoiding normal skin and rub gently and carefully into the skin. Avoid applying an excessive quantity which may cause unnecessary soiling and staining of the clothing and/or bed linen. At the end of each period of treatment, rinse the skin thoroughly with cool to lukewarm water before washing with soap. The margins of the lesions may gradually become stained purple/brown as treatment progresses, but this will disappear after cessation of treatment. For the scalp: Wash the hair with shampoo, rinse with water and apply Zithranol-RR cream while the hair is still damp. Rub the cream well into the psoriatic lesions. Keep Zithranol-RR cream away from the eyes. Care should be taken to avoid application to uninvolved scalp margins. Remove any unintended residue which may be deposited behind the ears. At the end of each period of contact, rinse hair and scalp thoroughly with cool to lukewarm water and then shampoo the hair and scalp to remove any surplus cream. This treatment may be repeated on alternate days if necessary. 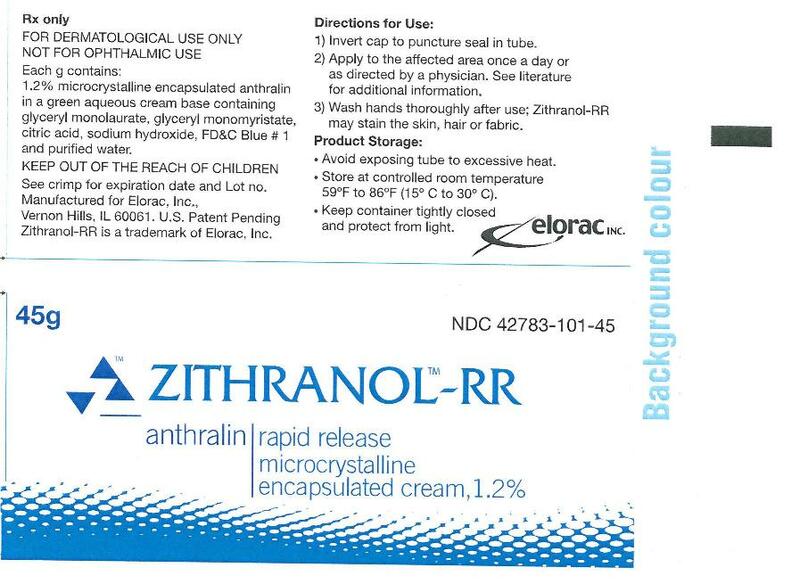 Zithranol-RR (anthralin) microcrystalline encapsulated cream, 1.2% is supplied in tubes.